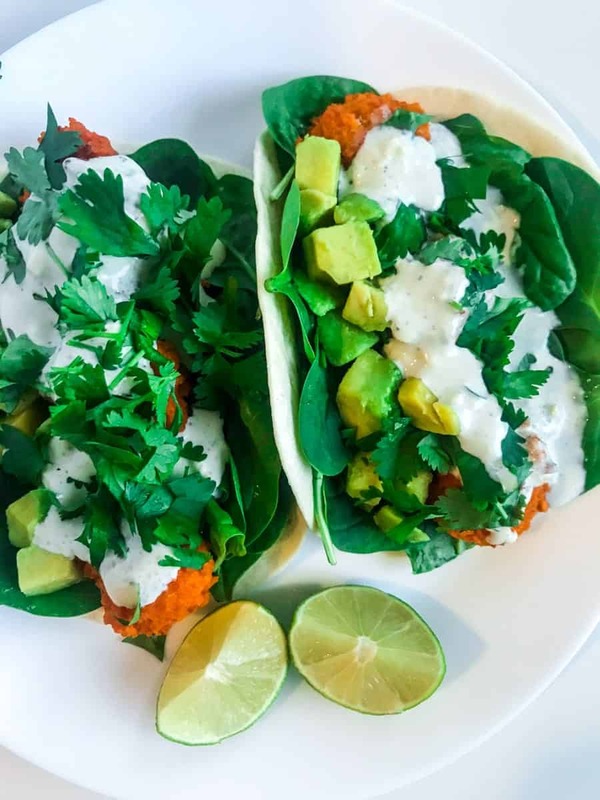 Put two of the world’s best things together and make it vegetarian – and there you have these easy, spicy and delicious Buffalo Cauliflower Tacos. 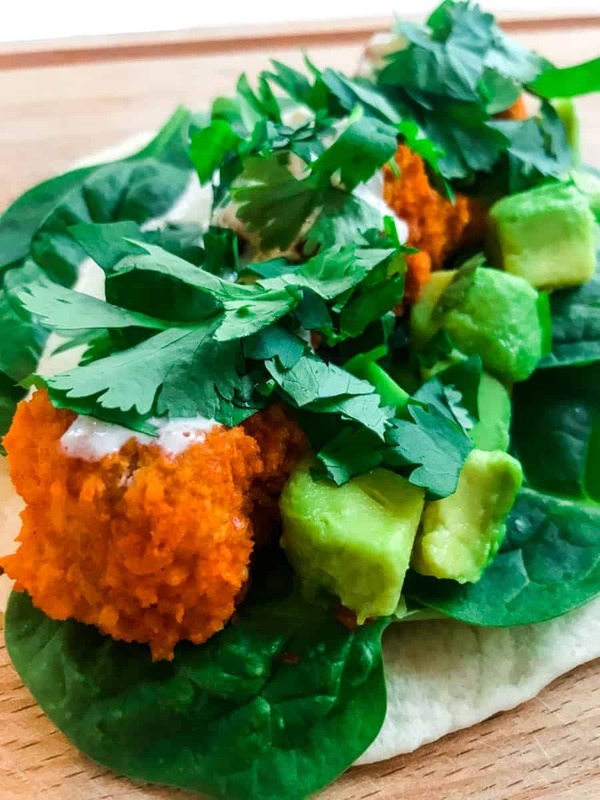 Because while buffalo cauliflower may be a quite new experience for me (here’s the entire story about how I fell in love with Buffalo Cauliflower) tacos and buffalo sauce definitely aren’t. 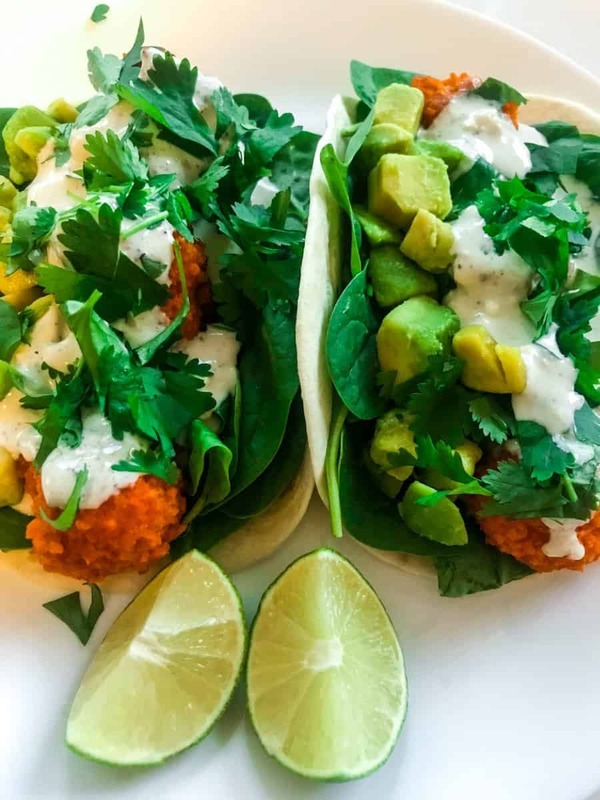 Tacos have probably been my favorite food forever (I at least remember always asking for it for my birthday as a kid), and buffalo sauce? Well, I do vividly remember really thinking buffalo wings were made from buffalos. (I mean, come on, who didn’t?!) And being really embarassed when I realized that didn’t go too well together with the concept of WINGS. I add some spinach and avocado as well, because that’s always a good idea. And then I add a lot of blue cheese sauce and serious amounts of cilantro, because that’s always an even better idea. And serve it with a slice of lime to press over just before digging in. Oh and I actually brought this as lunch as well one time. That kinda made my day. It was so good. And kinda fun to make my own tacos in the lunchroom. And also? It made my co-workers really envious, and that’s always fun. Enough about that now – just go ahead and make these, they’re delicious. Make them for all your friends while you’re at it. And if you do? Please leave a comment, and tag me if you post your creation anywhere @alwaysusebutter. Did you try it? 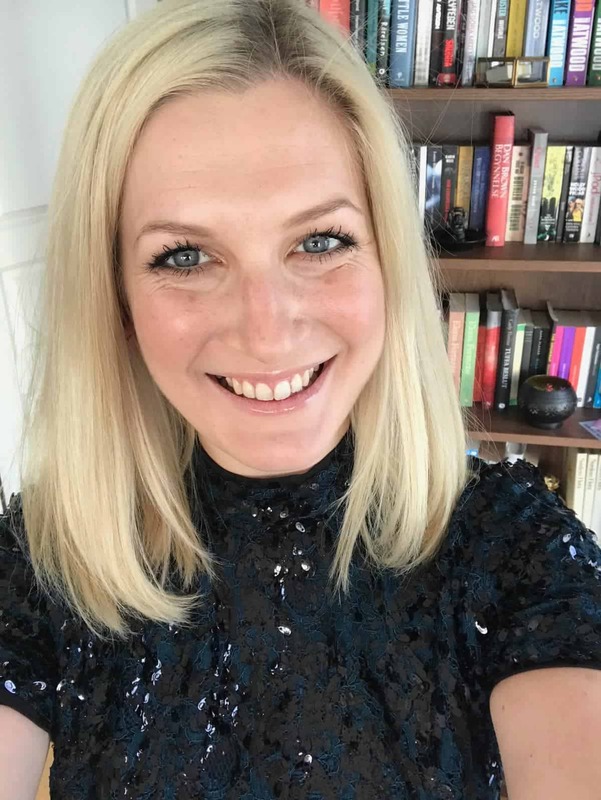 I’d love for you to let me know what you think – easiest way is by leaving me a comment and/or a rating! Place all ingredients in a bowl and mix together with an immersion blender. Add salt and pepper to taste, then place in the fridge until the rest is finished., at least 30 min. Set the oven to 225 C/430 F and place a baking sheet on an oven tray. Cut the cauliflower into bitesize florets. Not too small, but certainly not too big. Mix together the flour, milk, salt, black pepper and garlic powder in a bowl. Pour the panko in another bowl next to it. Add the cauliflower florets to first the flour-mixture, making sure that they get covered on all sides. After the flour-mixture, toss the florets in the panko. Make sure they get covered on all sides here as well. Place the florets on the baking sheet, well separated. Place the baking tray with the florets in the middle of the oven and cook for 20 minutes. 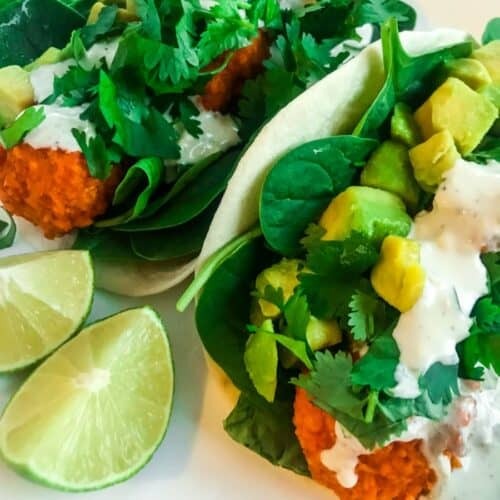 While the cauliflower is cooking you can prepare the buffalo sauce. Mix the melted butter with the hot sauce in a bowl large enough to hold both the sauce and the cauliflower. After 20 minutes, remove the cauliflower from the oven and add to the buffalo sauce. Toss, and then return to the baking sheet. 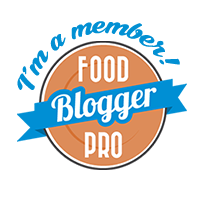 Pour over any remaining buffalo sauce. Place back in the oven for an additional 5 min. Warm the tortillas in the oven or microwave for a minute or two. 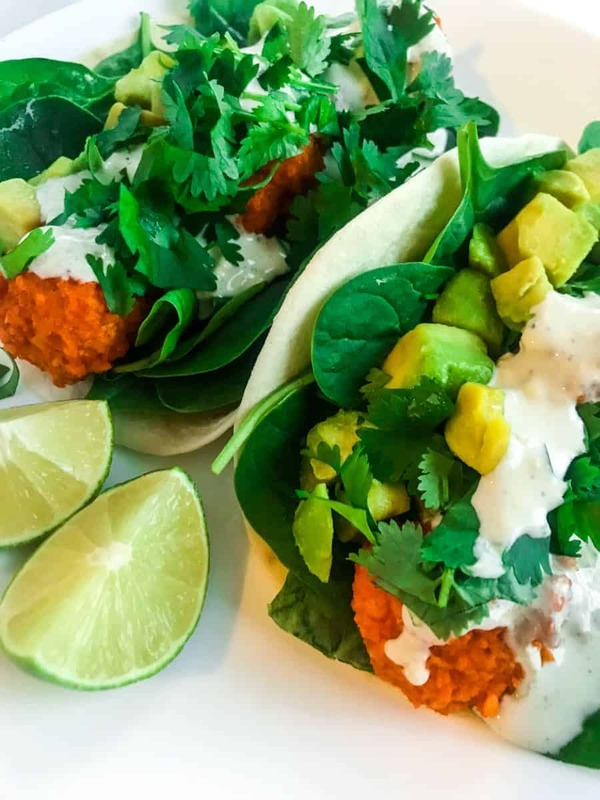 Place the warmed tortillas on a plate and top with spinach, buffalo cauliflower, avocado and blue cheese sauce. 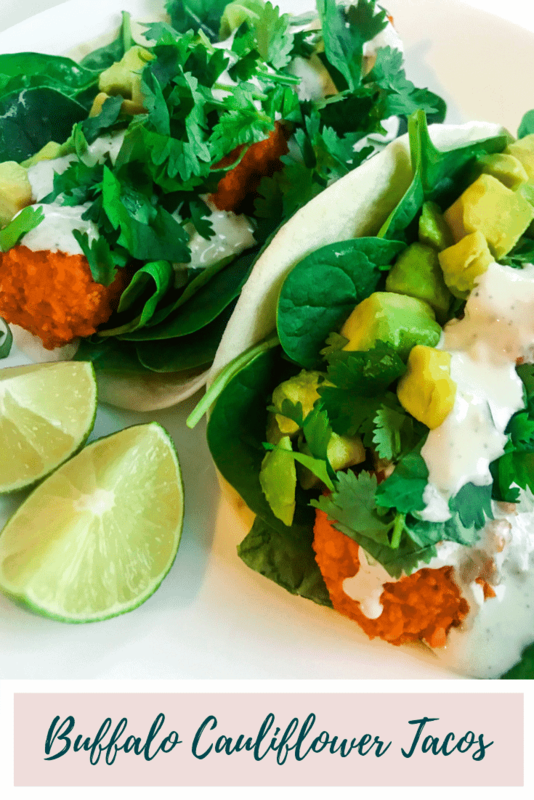 Top with fresh cilantro and serve with a wedge of lime.